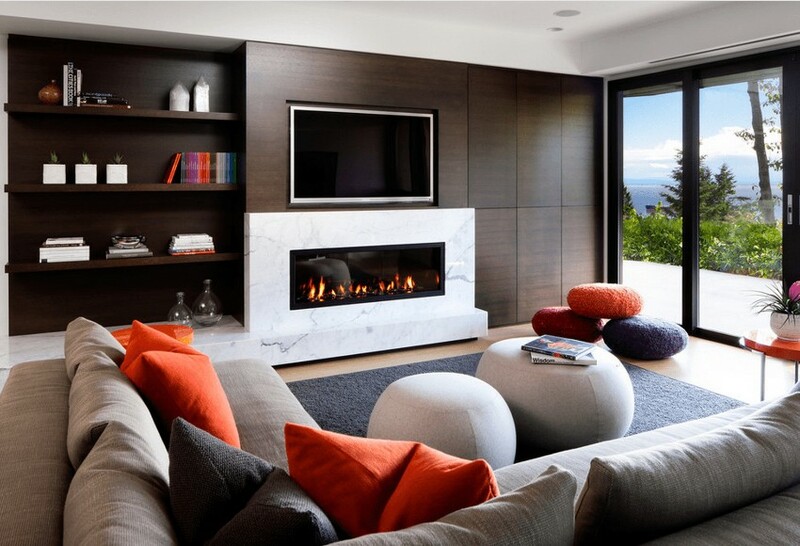 Modern living rooms can be as warm and welcoming as any other type of living room. And if you do not believe it, then 16 rooms of modern design and style, that you will want for your home. When it comes to interior decoration, the word “modern” tends to evoke images of rigid and cold spaces devoid of personality, which favor aesthetics over comfort. Nothing is further from reality. 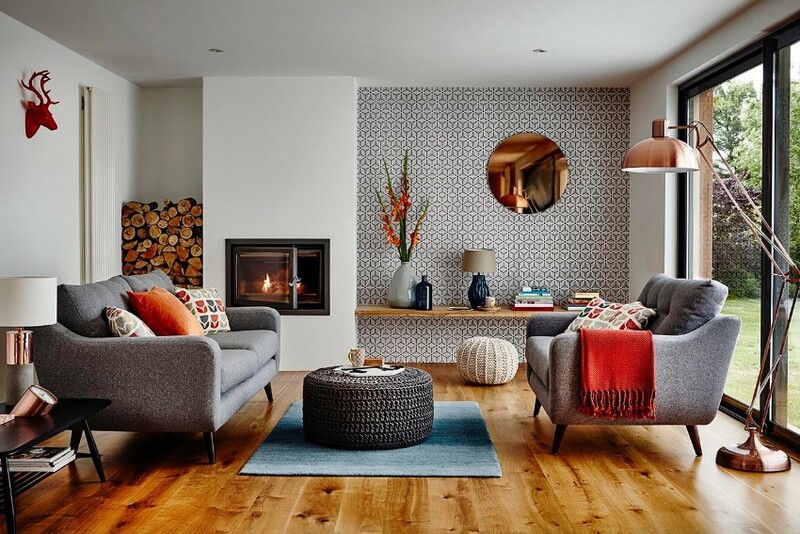 Modern living rooms can be as warm and inviting as Nordic living rooms or rustic living rooms. 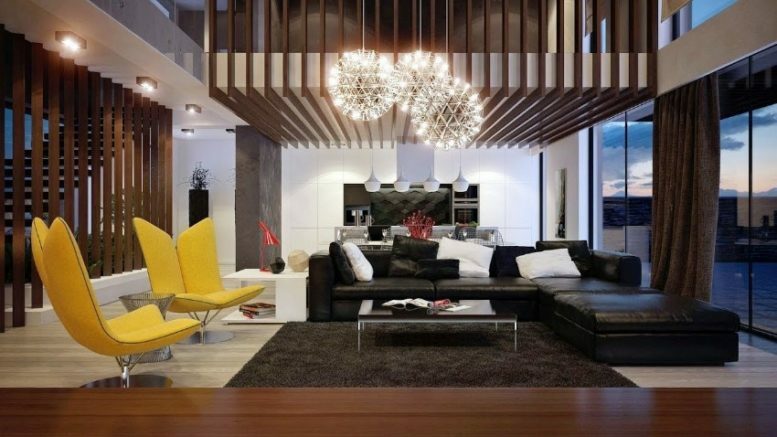 While modern living rooms may lack some of the ornaments of their more embellished counterparts, the modern-style living rooms compensate with their elegant and sober sense of space. In an attempt to combat this common misconception, we have compiled a collection of modern salons that demonstrate that contemporary design and style do not exclude well-being and comfort. 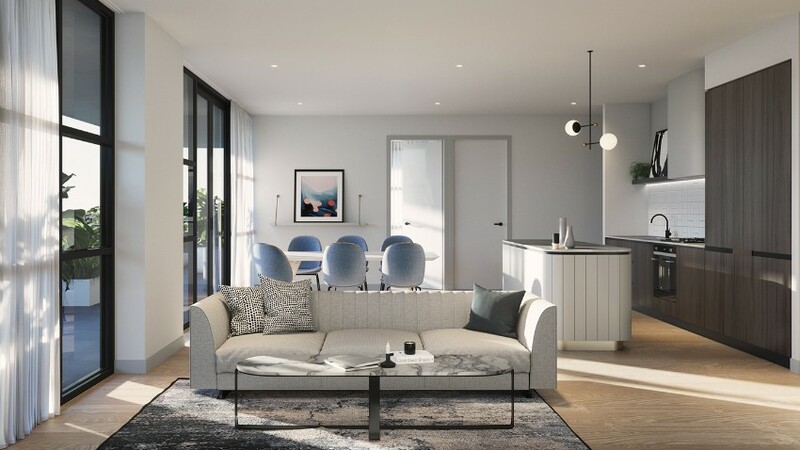 Located in the most vibrant and lively neighborhood of Melbourne, One Wellington is an apartment with wide panoramic views designed by the award-winning firm of architecture and design KPDO. The living room has an air of European sophistication combined with the warmth of Scandinavian interiors. The minimalist palette of neutral colors, combined with the texture of the sofas, manages to create a very peaceful and inspiring space. Very elegant! The walls overwhelm you, then … how about trying a big window? 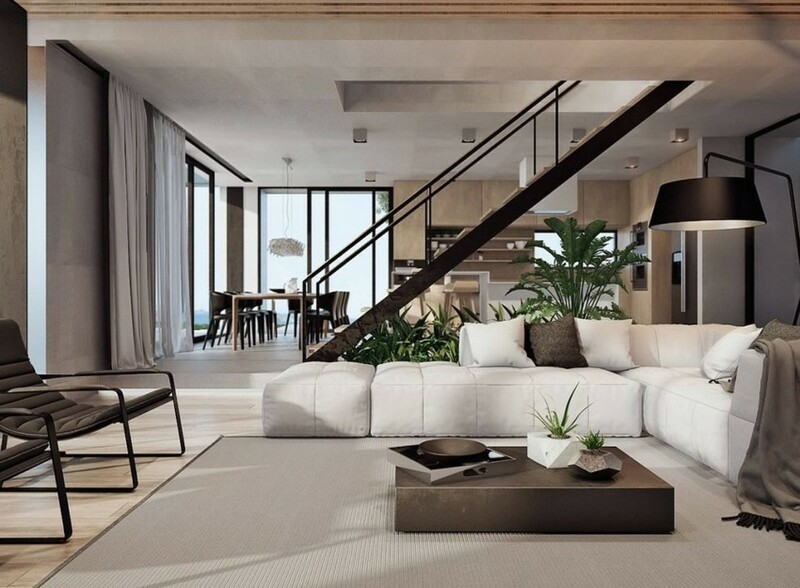 This spacious living room designed in neutral colors is the ideal place to spend time with family or friends. The wall to wall window allows a lot of natural light, making space look even bigger and more welcoming. All while you admire the impressive vegetation outside. The wooden ceiling and the hanging bubble lamps are the absolute protagonists of this sober lounge in gray tones. Special mention deserves the large window. It is one of the modern living rooms. Inspired by Le Corbusier, the real estate company Genova Property has developed a set of 47 apartments distributed in three buildings, in the Swedish city of Uppsala. The interior designer Louise Liljencrantz has been responsible for the design of the interiors of the houses. A good example of its good work is this impressive room. With a careful selection of materials and furniture, the elegant hand of Louise can be seen throughout the room. 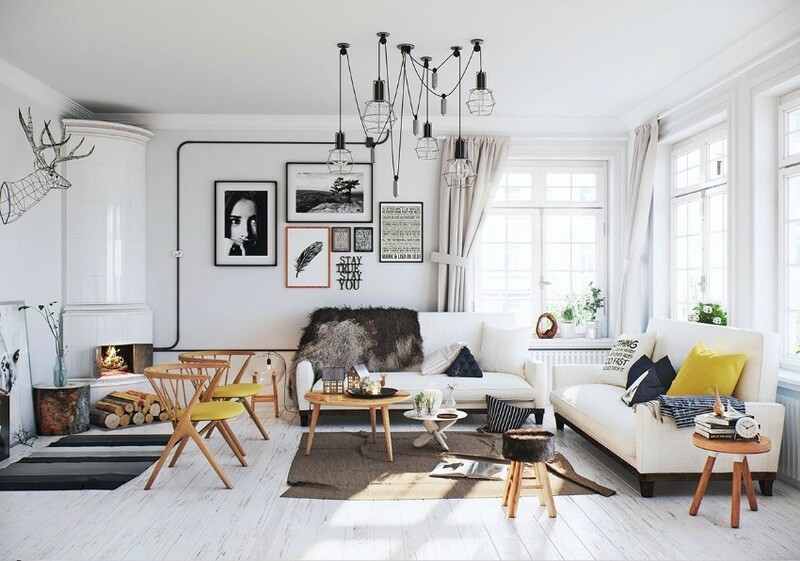 This beautiful living room has been served by flirtatious low-rise futon sofas to create a very cozy space. A row of windows painted in white and touches of mustard and light pink accentuate the style. 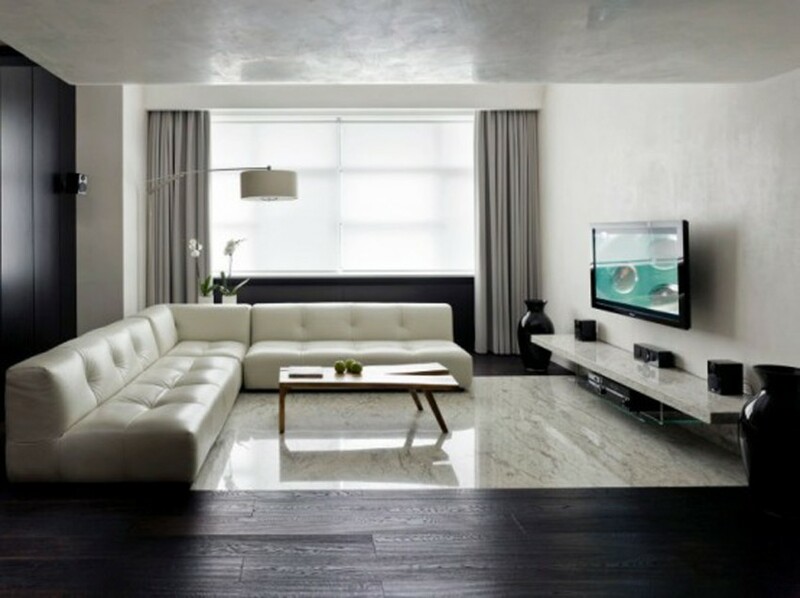 A minimalist decoration for a living room dressed with a sofa in gray graphite tones, a built-in fireplace, a television of XXL size and the white color in walls, floor, and curtains. It is one of the modern living rooms. In this room, wood and wicker counteract the coldness of stone, marble, and glass. The chocolate brown color of the sofa creates a beautiful contrast with the wall. In this dining room, they have used the brown color (the opposite in terms of gloss to beige) of the coffee table and chairs, to achieve a very soft and serene atmosphere. And the beige color, with its many shades, is perfect for dressing the walls of the house with sophistication and elegance. With the help of Faulkner Architects, and located in California, the CorTen Steel House is a dream house. The living room, an elegant and modern space, is dressed with designer furniture and is connected to the outside by large glass walls. A large sofa, minimalist designer chairs, a marble coffee table with metallic details, bright wood, golden accents and an origami piece of art, for a living room that transmits a lot of serenity and peace. 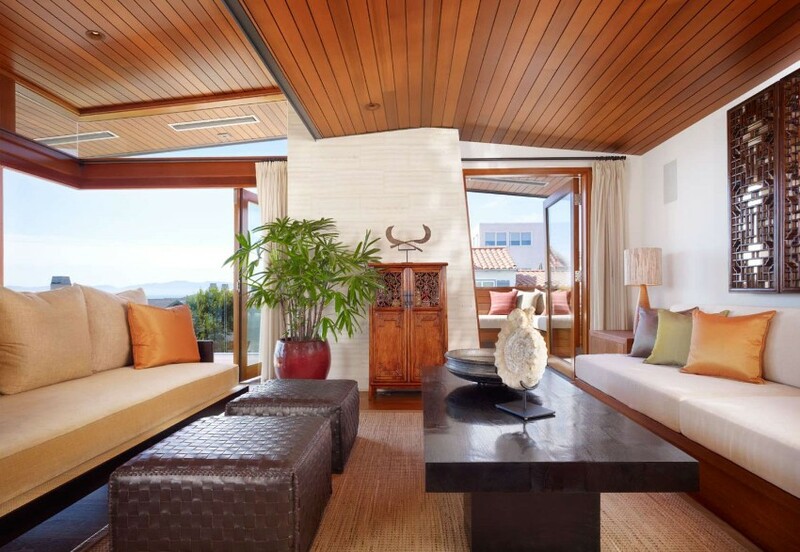 The quiet unpretentious elegance of this living room is inspired by Zen decor. 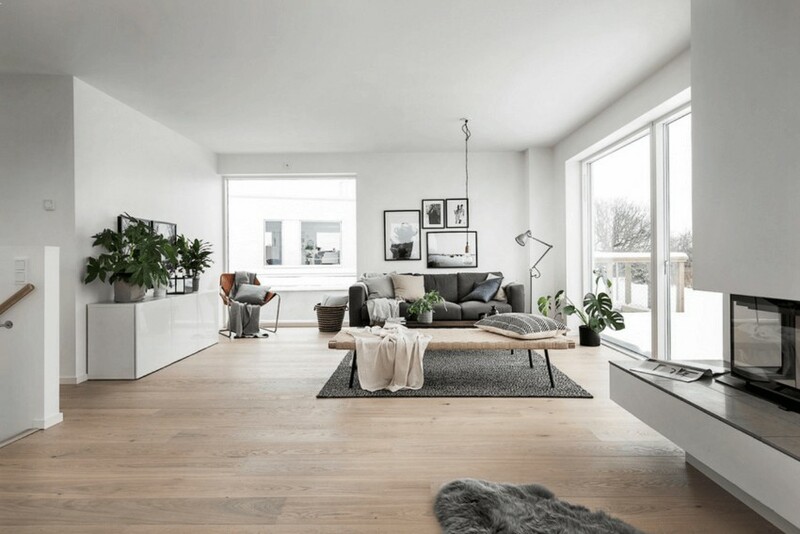 Spaces open and free of clutter, light wood panels, minimalist Nordic furniture, and black and white details, for a room that invites peace and reflection. It is one of the modern living rooms. The brick walls have seen and the large window with steel enclosures of this room, reminiscent of the typical factories of the early twentieth century. The sofa, the Scandinavian school chairs and the great work of art that presides over the wall complete the decoration. 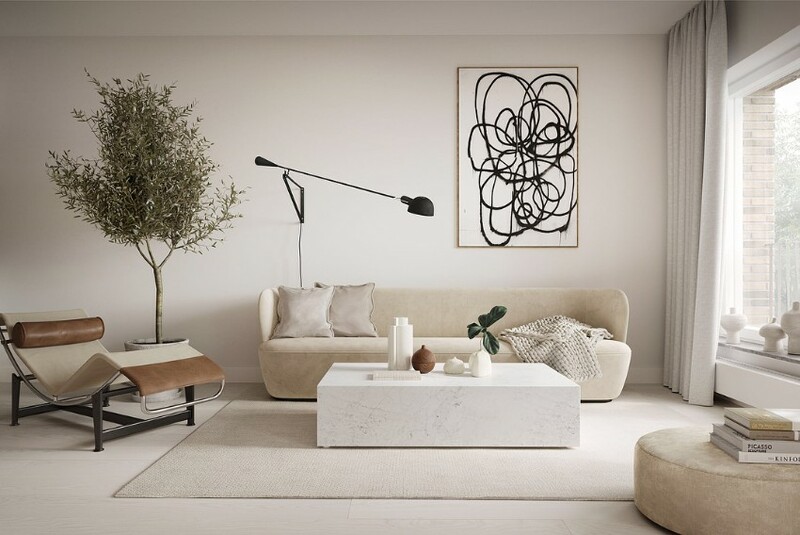 The popular interior designer Lotta Agaton, in collaboration with the housing development company Patriam, was commissioned to design several new production apartments in Vasastan, Stockholm. The new owners can already be happy with the elegant and minimalist decoration that Lotta has given to the room. Modern minimalism! A flirty wall-mounted fireplace, black wood accents, warm textiles and an elegant coffee table in a minimalist living room with modern design. Combining the Japanese aesthetics of Zen and the charm of a country house, this beautiful house on the coast, just one hour from Copenhagen, Denmark, has been completely renovated and updated by the prestigious architecture firm Norm Architects. 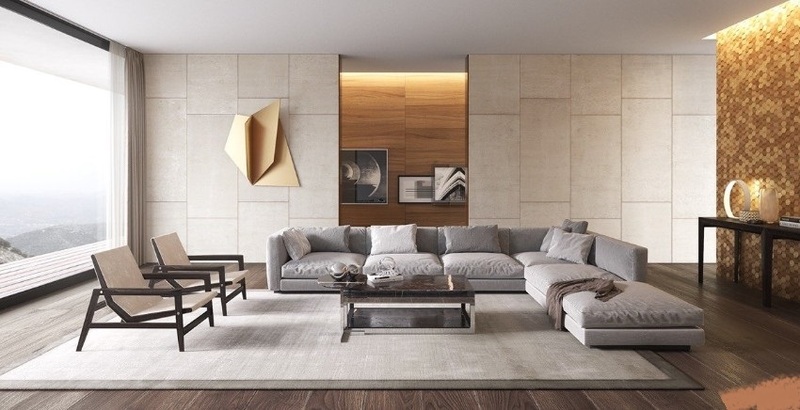 The living room has a rich palette of natural materials in earth tones: ceramic, wood and stone. Designer furniture, sculptures, and pieces of art complete the decoration. A dream of home! 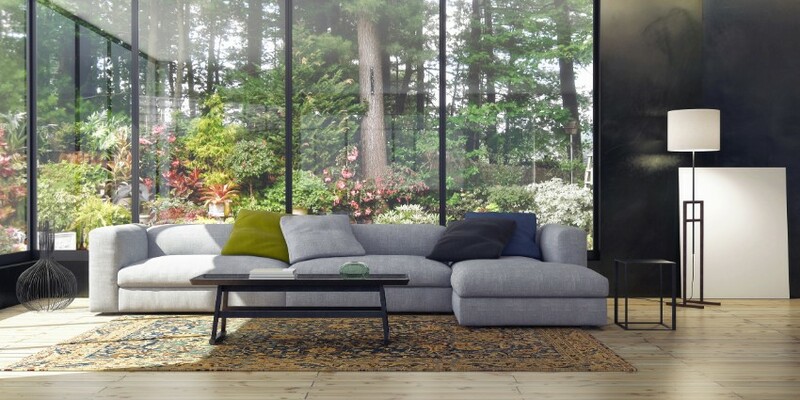 Be the first to comment on "16 Modern Living Rooms That You Will Want For Your Home"